This article reviews the latest weekly sentiment survey we conduct over on Twitter. The survey measures respondents’ equity and bond positioning/view – differentiating between whether the view is bullish or bearish for technical or fundamental reasoning. 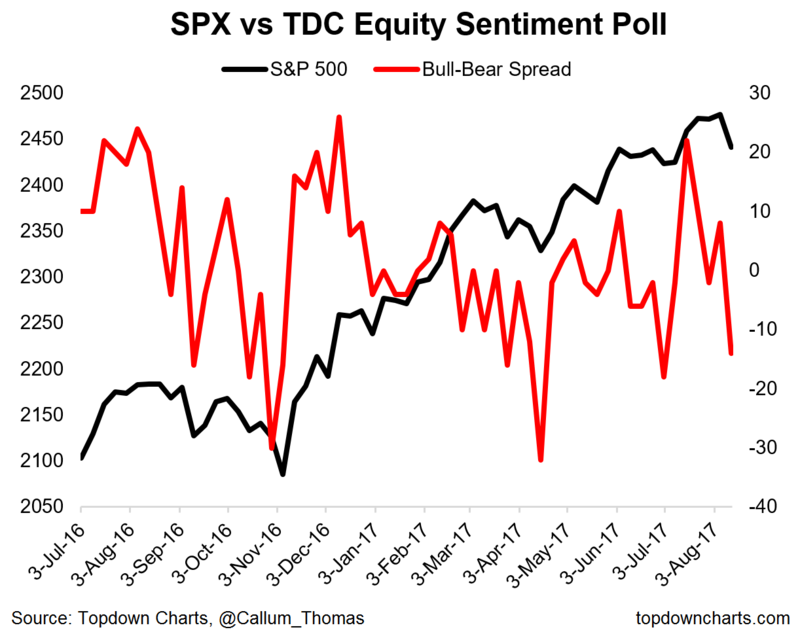 The results show a clear and sharp shift in equity sentiment to the bearish side. The move is primarily driven by technicals sentiment, and was largely mirrored in the bond survey. At first glance it looks like a classic selloff and you could argue that the sentiment readings look “oversold”. But obviously the North Korea saber rattling was a big driver. I suspect that this would be reflected in the fundamentals sentiment, yet it is technicals sentiment that has moved the most. A separate poll I’ve launched gauges how people are approaching the new week, and so far people seem to be erring on the bullish side or plan “buy the dip” as it seems the bluster traded between Trump and North Korea looks to be more hype than high probability event risk. Overall, I’d say while the current selloff could go further, it’s going to need more headlines and more than hype to get too carried away. The overall net-bulls (total bullish sentiment minus total bearish sentiment) dropped sharply on the week, and is around previous levels when we saw minor selloffs/corrections. Equity fundamental net-bulls are holding up so far, while the drop in overall sentiment is being driven by technical sentiment. At first glance at these charts it looks like the selloff could be short-lived. 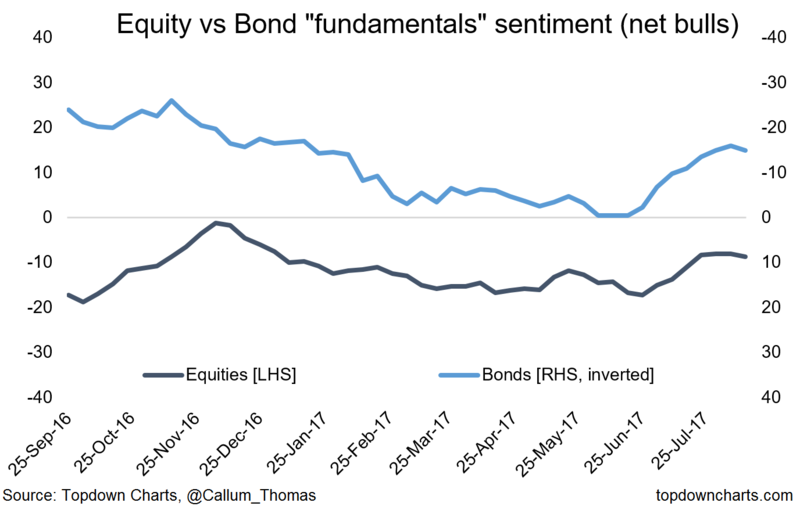 I previously highlighted the upturn in "fundamentals" sentiment, yet the latest data show a turn on both the bonds and equities fundamental net-bulls. This will be one to keep an eye on. For institutional grade insights on the global economics and asset allocation, and some more good charts you may want to subscribe to the Weekly Macro Themes. Click through for a free trial.